I recently grew a red maple from seed after cold stratification. The seedling is now about 4 inches tall, and i am not sure what to do next! Do i need to repot? What are its watering needs? If anyone could help with basic techniques this would be great. Its currently in a little cardboard pot with bonsai soil, and looks like these, but the head has already gone, and it is a little smaller. 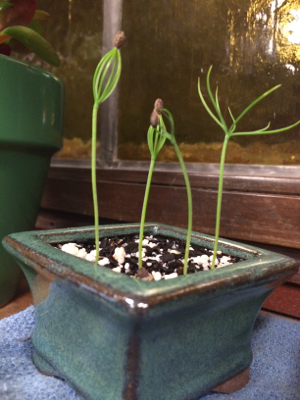 I generally let seedlings grow for a year before repotting. I think this is particularly good advice for those who are new to growing seedlings. Once you have some experience, there are some tricks and techniques to get more uniform roots that can be applied to young seedlings, but if not applied correctly you end up with dead seedlings. Sink the pot in the ground in full sun where it will get some moisture regularly, like near a downspout. Feed it with any commercial liquid according to directions every week from each May until ~August 1st. Leave it sunk until April, 2021, when it will have roots that escape through every orifice. Repot, trim & wire in the size pot that you want it to be in and sink the pot again until April, 2023 (leaving the wire on for no more than ~6 weeks in the growing season, and re-wiring as often as you wish. Do it laying on the ground). By then you will understand the process and will decide how big you want the tree to ultimately be. One year in the ground = good growth; the second consecutive year in the ground = extremely good growth; third consecutive year in the ground = all the feeder roots are too far away from the pot. It is a TWO year cycle. Once they harden off cut the tap root out. What is that again? Looks like pine from here. If it looks like "These" it's not a Maple, those are Pine sprouts.